How do you measure LOYALTY? Thursday’s USA Today featured an article on how US airlines are reconsidering how they gauge frequent flyer value. Because statistics show that collecting frequent-flyer points is the most popular perk to flyers, the debate is still up in the air about how best to reward loyalty – miles vs. fare. Air Canada has worked on a tiered based loyalty structure for a few years now, the more you pay the more miles you get as your reward. I wonder how many complaints they recieved when the first introduced the change - I'm guessing there was a bit of an uproar. Coincidentally I was on a flight from New York to Hong Kong yesterday, so I had lots of time to think about the changing face of loyalty. If the airlines go ahead and make changes to what is a highly touted program should we consider changing how we recognize clients, suppliers and even staff for their loyalty? Will we look for longevity, continued support or how much money a contract, client or team member bring us? We have always believed in building our fan base - so how do we reward fans who support us via word of mouth referrals to colleagues they know even though they may not bring us any direct business? Will how we reward our most valuable partners change? Send me your opinions or comments – I’m interested in what you think. BTW – A big THANK YOU for all the wonderful people who bought turkeys from us last week for Second Harvest. The aNd team sold 97 turkeys in 4 hours. The turkeys are distributed to local meal programs and food banks so thousands of hungry families will receive a nutritious meal this holiday season. Shawna and I just returned from New York City where we helped organize a series of events to promote the Ontario Financial Services Industry. Even after so much devastation caused by Hurricane Sandy, New York bounced back stronger than ever. We saw first-hand the power of picking yourself up, dusting off the crap, and moving on. 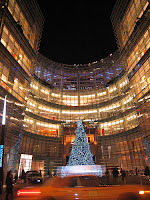 The Bloomberg Tower in the heart of New York City, known as "731" is home to more than 5,500 employees from all of the company’s businesses. Their headquarters set the standard for Bloomberg’s unique and vibrant workspaces, with an emphasis on openness and transparency, health and exercise. At 731, bold colors and dramatic architectural reflect the energy and dynamic spirit that make Bloomberg a hub to the whole world – you can definitely feel the vibe as soon as you walk in. There are several spaces available for meetings and receptions. Security is tight and a list of all attendees must be given in advance. Photo ID of each attendee is required before gaining access. A big shout out to Susanne and Pam, who were fantastic to work with for our event. 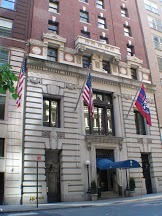 The Penn Club of New York (usually referred to as The Penn Club) is a private club located in Midtown Manhattan, New York City, New York, USA. Its membership is restricted almost entirely to students, alumni, and faculty of the University of Pennsylvania in Philadelphia, Pennsylvania. Built in 1900, it’s clubhouse is a fourteen-story building with a library that has a traditional fireplace, fitness facilities, 2 formal dining rooms, function space and guest rooms.